TO PREPARE CHOCOLATE SPONGE CAKE: Preheat oven to 350 degrees. Separate the eggs, making certain that none of the yolk mixes with the whites. Sift the cornstarch, flour, and powdered cocoa. Whip the yolks and 1 cup of sugar at high speed for 5 minutes, until the mixture whitens and forms a ribbon. Reduce the mixer speed to low and pour in the water and vanilla. Immediately fold in the cornstarch, flour, and cocoa. Set aside. Whip the egg whites with a pinch of salt in a separate bowl. Start at low speed; then increase speed as the whites begin to rise. Continue whipping while gradually adding the remaining 2/3 cup of sugar until the whites form soft peaks. Do not over-whip. Gently fold the yolk mixture into the whites with the aid of a rubber spatula. Pour the batter into a 3 inch deep, well-buttered and floured 10 inch cake pan. Bake at 350 degrees for approximately 25 minutes. Test by inserting a skewer or toothpick into the cake. The cake is done if the skewer comes out clean. Turn out the cake immediately and cool completely before using. TO PREPARE MOCHA BUTTERCREAM: Combine the whipping cream, sugar, salt, espresso, and 1 stick of butter in a heavy saucepan. Place over high heat and bring to a boil, stirring occasionally. Remove from heat. Beat the egg yolks in a glass or stainless steel bowl with a wire whisk. Slowly, pour the hot liquid into the beaten eggs, whisking constantly. Pour the mixture back into the saucepan and place over high heat. Return to a boil, stirring continually. Remove from flame and transfer to the bowl of your electric mixer. Whip on high speed for 5 minutes to aerate and cool the mixture. Reduce speed to low and add the remaining 3 sticks of slightly softened butter, 1 stick at a time, until completely blended. Resume whipping on high speed for another 7 to 10 minutes, until the frosting is fluffy and achieves a spreadable consistency. If after 10 minutes the frosting remains too liquid, chill for 5 to 10 minutes and rewhip. TO PREPARE SUGAR SYRUP: Combine the sugar and water in a small saucepan and boil over high heat. Remove from flame and allow to cool. Stir in flavoring, if desired. The syrup may be prepared in advance and stored, covered, in the refrigerator. 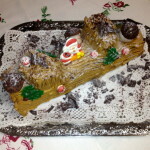 TO ASSEMBLE MOCHA BÛCHE DE NOËL: Whip the prepared Mocha Buttercream to spreading consistency. Place the cooled sheet of Chocolate Sponge Cake on a sheet of parchment paper or plastic wrap. Add the dark rum to the cooled Sugar Syrup. Using a small pastry brush, evenly coat the sponge cake with the syrup. Cover the sponge cake with a 3/8 inch layer of the Mocha Buttercream with the aid of a spatula. Roll the cake over itself to form a roll. Wrap and refrigerate for at least one hour before assembling the Bûche de Noël. Remove the rolled cake from refrigerator. Slice off two ½ to ¾ inch sections from each end of the roll. Frost the log completely with the Mocha Buttercream. 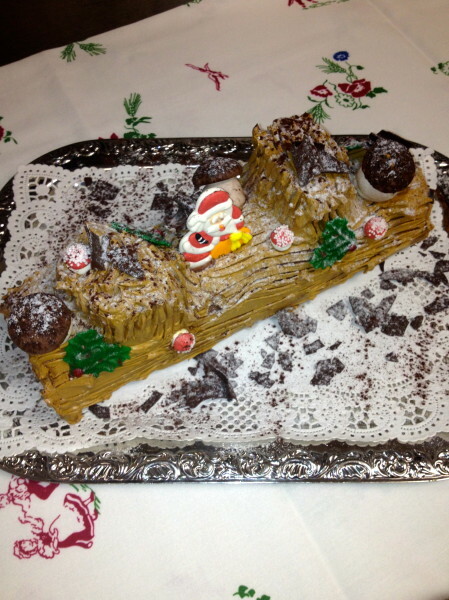 Place the 2 slices of cake onto the log approximately 2 inches from either end. Frost the top and the sides of the slices to form the look of cut branches. Dip a fork into hot water, press lightly into the frosted log, and run the length of the log to form the look of bark. Decorate the “cut branches” and ends of the logs in a circular pattern to form “rings”. Refrigerate cake. Just before serving, dust lightly with confectioner's sugar to give the impression of frost or snow.